Great photos. I've very jealous... I'm still looking forward to doing it, but right now school is taking up all my time. Great report! Makes me want to pack up and walk out the door now! great pics too. But, then I came back to the HF report and enjoyed all the pics more for the text on your experience and the context they provided the pics. Really well done. Thank you. Yeah, picasa's nice if you really want to zoom in on the detail of the snake, for example, or want to know exactly where is that section of beach, but I too enjoyed more the writing of the story, reliving the trip as I did so. Glad you enjoyed it to. Do you keep a daily journal when you are camping or did you remember all that off the top of your head? If you did the journal then you are a better man than me for the discipline to write about your day each day. If it was off the top of your head then you have a way better memory than I have. Yes, I filled a spiral notebook. lol, I probably would have hiked more if I wrote less But then a lot of this log was from memory, when I had a camera handy and not my notepad (snakes on the trail and stuff like that). Does your camera geotag your photo as well? Great report and great pix! Thanks for sharing. No, but I have a process for that. 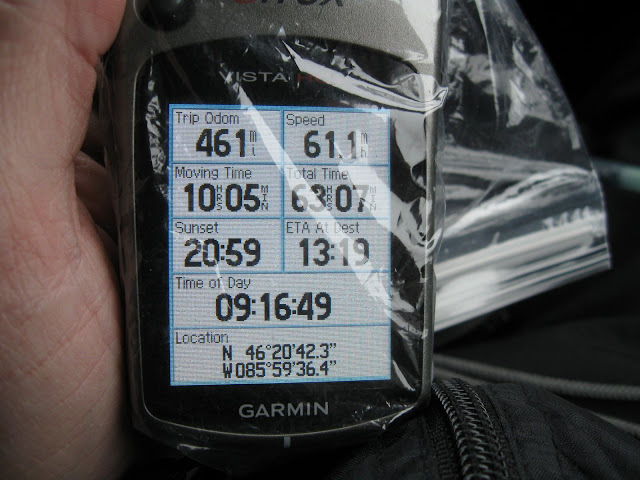 At the beginning of the trip I take a picture of my GPS showing the satellite time. Then I've got my GPS constantly logging my position throughout my travels. When I get home, I compare the timestamp on the first photo to the GPS time shown in the photo and determine the difference, then use a very quick utility to adjust the timestamps in all the photos by that amount, so I know they're all exact. Then I use another program which goes through each photo and tracklog to figure out exactly where I was when each photo was taken, and embed the GPS coordinates into the EXIF header. Finally I check my work by comparing the computed location of the first photo to the location shown in the picture.